It is also fun to order the same dish at different restaurants to compare, and find their own personality in the each dish served. If you ask me what they do best, I think they probably do great on sauce that goes with dish they serve,along with seafood dishes. I love salmon, and eat the Grilled salmon dish at many dishes,and many restaurants serve over cooked dry fish or under or over seasoned salmon, but their salmon is beautifully cooked without over cooked and they are juicy and moist with a bit of char on the fish. Both restaurants serve salmon very moist and juicy and tasty,but some of the salmon dishes Firebirds Wood Fired Grill (chili rubbed salmon with key lime butter) was over salted and even if I tried eating the fish with bread,it was like eating a block of salt and it was not pleasant experience. That being said, their Wood Grilled Salmon (I always ask the server to have my favorite Ginger mustard aioli on side) is spot on dish and, they are not over or under seasoned and beautifully cooked without the fish being overcooked. This is one salmon dish I would highly recommend. What makes Bonefish Grill’s Norwegian salmon makes extra special to me is that, not only the fish is cooked juicy and moist, but also they have great sweet-spicy Mango salsa to go with. There are some other choices of sauces but my all time favorite is the Mango salsa. Their salsa is not like the one that look like all the components are chopped and mixed and served,which often times “dry” consistency and it does not add much flavor to the fish. Theirs have consistency of the “sauce”, and it adds a little more flavor to the grilled menu and I love them. Just recently,I made my version of Bonefish Grill’s Norwegian salmon with Sweet-spicy Mango salsa,and it came out super good. Maybe my second version of Mango salsa introduce to you is a little spicier than Bonefish Grill’s Mango salsa but it was tasty. I loved them. If you love salmon, you would love the flavor. If you follow my blog entries, you would notice she is a big fan of fish and she loves salmon. In the end, I left small bits of salmon and gave it to her without salsa on top of course.She loved it! I think the Mango salsa goes well with many variety of fish, scallops, shrimps,and maybe good for grilled chicken etc.. as well. If you had steamed snow crab, you could remove crab meat, mix it with cooled salsa and serve it on the bed of lettuce, you could have it as salad. I think it is good for grilled meat type of wraps too. Maybe protein source like Turkey,Lamb might be a challenge since it has unique flavor to its meat, but I can see variety of ways to incorporate this tasty mango salsa into your dishes. In the past entry titled “Bonefish Grill menu; bacon wrapped sea scallop with Mango salsa Yassy’s version“, I have already introduced how to make sweet-spicy Mango salsa, but this one is another version of my mango salsa. This one is a bit more spicier than the previous one and use a little different ingredients but, when it comes to heat, you can adjust your level of spiciness by reducing amount of ingredients that gives heat such as “sriracha”. My version of Bonefish Grill’s Norwegian salmon with warm Mango salsa is broiled salmon with spicy Mango salsa. Broiling adds the fish really nice flavor with bit of char on as if it come off from the grill and, I really liked it. 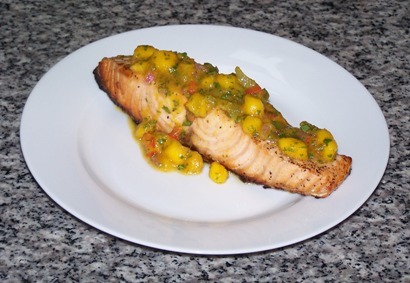 Broiled salmon with spicy Mango salsa..
Sriracha is a Thai version of hot chili sauce. It is a little thicker consistency than regular American hot sauce, and it has much different flavor to it. With consistency wise,it is more like a consistency of tomato paste if you will. You can get the Sriracha chili sauce at International food aisle at the local grocery store or at Target. If you live near Asian stores, they should carry the condiment as well. 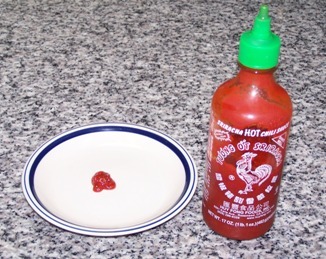 My favorite brand for Sriracha chili sauce is by Huy Fong Foods. You can look for green top squeeze bottle with white letters on. Below is a picture of Sriracha. ** Mango salsa maybe good sauce for grilled chicken, fish, shrimp etc..
from this recipe, and puree Mango with jarapano, cilantro, with same spices (wasabi powder, sriracha) and lime juice, it would make nice dipping sauce for the spring roll too. 3. Line the baking pan with non stick foil,and place one slice of lemon under each salmon fillet.Place the salmon skin side down. ** As a general rule, every inch of fish fillet, you would cook fish for about 8-10 minutes total. However, some fish has more fat content than others, and following only cooking time is not the best way to have moist,juicy fish every time. Best way to cook the fish without it being overcooked is to keep an eye on its internal temperature for the doneness. ** Butter is nice to make the salmon fillet to get char a bit around edges when it is done, but since butter has low smoking point, even if the lemon is added to broil with, when you open the oven after 5 minutes broiling time, some smoky steam may comes out.